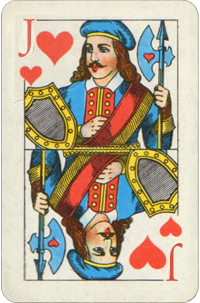 Jack Of Hearts Birth Card. Destiny Cards Free Reading. All Jacks correspond to number 11. By some called the number of Evil because it transcended the number of commandments, and did not attain 12, the number of Grace and perfection. History and experience refuse its stigma. The number 11 is the most priceless gift of God. It is a man (1) beside God (10). Jacks are sons of the Kings. They carry great responsibility, and the disposal of their lives rests entirely on their decision. They represent the mental attitudes of any suit, and of course; our mental attitudes are entirely within our control. We can rule them and win the crown, or we may consign them to every wind that blows and struggle in a state of immaturity as long as we live. It is believed that Jack of Hearts wins his crown through sacrifice for love. This card is also called "The Card Of Christ." Jack of Heart's people are the most "innocent." They belong to the unique family of Seven Cards, and also one of the three fixed cards of the deck. Tremendous emotional power and personal charisma create this colorful, expressive personality. People measure up to their example, and many Jack of Hears mission is to "service through love and sacrifice." They often become famous in some way - some as politicians, or an actor, but they also make the best teachers, counselors, ministers and good-hearted, understanding parents. Jack of Hearts combines the heart power and the mind brilliance. Their education might be interrupted by some family situation of some emotional nature, but they usually catch up later. They are willing to learn, to listen, to read. Early years might be a series of tests on love, and the principle of Christ - love is impersonal. Seven Of Hearts work better in partnerships and like to be with people who are well-informed and learn quickly. They are exquisite friends, kind employees, and patient coworkers. They care about friendship, and of the relationships get broken, they intensely suffer. They prefer to work with men. And after all, of course, like a Jack of Hearts, you have excellent leadership abilities. Always keep the management of your deals in your hands and don't doubt your ability and handle them. Jack of Hearts have sufficient amount of self-confidence, but experiments and changes might scare them. With age, they become more business-like. You may reach a position of leadership, but not seek publicity and fame. For some Jack of Hearts, their father might be hard-headed and push them to pursue an occupation in medicine. But this cards doesn't suit well in medicine, - extrasensory healing is a better choice.